Students will be able to interpret words and phrases from the reading excerpt appropriately. Students will be able to make inferences about Wendy Darling, using textual clues and facts to back up their opinions. To begin this lesson, review with your class some of the aspects of Peter Pan's personality. Tell your students that they will once again be working in their Peter Pan and Neverland workbooks, but today they'll be shifting their focus from Peter's behavior to Wendy's behavior. Activate your students' prior knowledge by asking some questions about Wendy. For example: Who is Wendy Darling? Why is she special? Do you think that Wendy has a similar personality to Peter's? Why or why not? 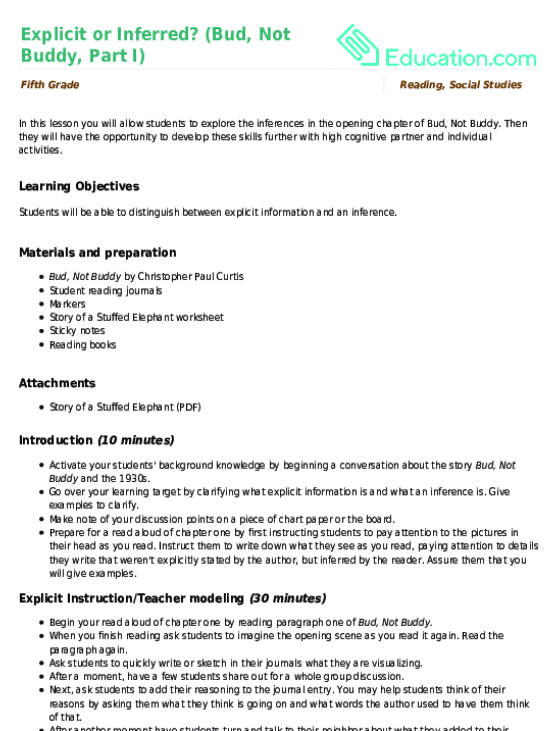 Instruct your students to turn to page 9 of their workbooks, titled Chapter 4: The Flight Part 2. Explain that the class will be reading the passage on page 9 independently. They will use what they learn in that passage to answer the questions on pages 10 and 11.
Review the instructions on pages 10 and 11 aloud with your students. Answer any clarifying questions your class has before moving on. 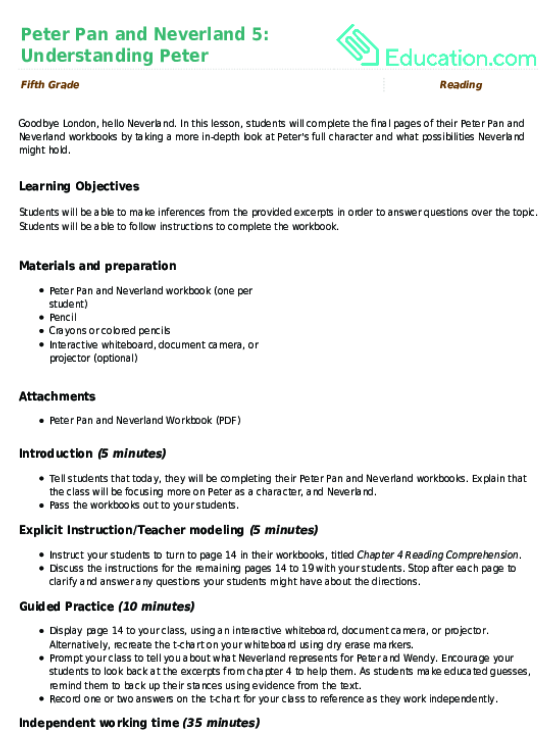 If necessary, complete a sample question on pages 10 and 11 to help students understand what they're expected to do. Before students begin reading, remind them to pay close attention to Wendy and what she does in the passage. Encourage visual learners to highlight or underline words and phrases that describe or make implications about Wendy's personality. 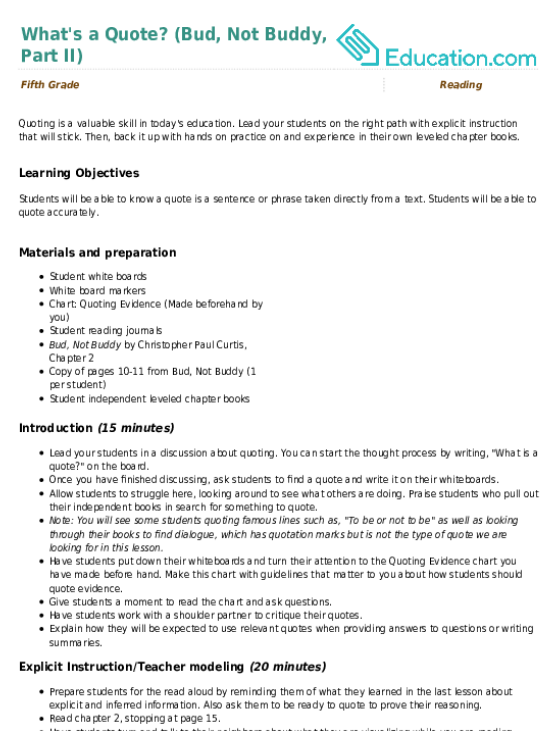 Instruct students to begin reading on page 9. Once they're done, request that they move on to pages 10 and 11. Enrichment: Challenge advanced students to answer the questions on page 10, focusing on John or Michael instead of Wendy. They can write their answers on a separate piece of lined paper. Support: Gather students who need additional support together in a small group, and read the passage aloud with them. Each time a word or phrase pops up that says something significant about Wendy, encourage these students to circle or underline it. That way, it will be easier to reference while answering questions. Discuss each question in detail, asking them guiding questions to help lead them to correct answers. Collect your students' workbooks to gauge their understanding of the passage, and of Wendy's general temperament. If your students' answers are all over the board, record some key words or phrases from the passage that illustrate Wendy's personality on the whiteboard. Review the words or phrases that allude to Wendy's personality, if necessary. Ask your students to share their impressions of Wendy Darling, citing evidence from the text to back up their opinions. Ask a reflection question, such as "If you were Michael's big sister and watched him plummet from the sky, how would you feel about Peter's behavior?" or "Some of you agree that Wendy is quite bossy. I want you all to think about how Peter acts compared to how Wendy acts. Is she really that bossy, or is she just trying to take care of herself and the boys?" 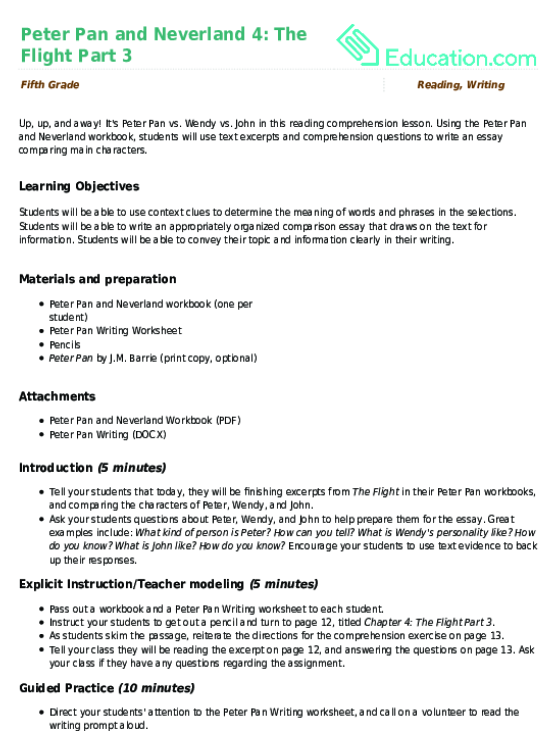 Using the Peter Pan and Neverland workbook, students will use text excerpts and comprehension questions to write an essay comparing main characters. 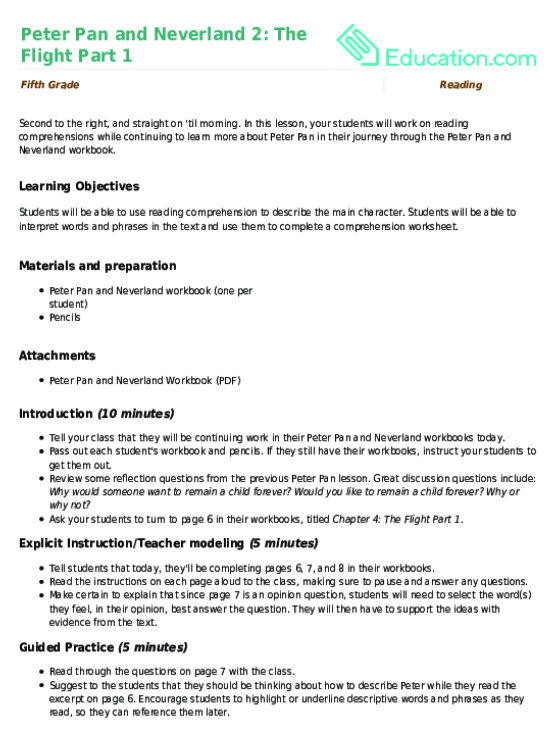 In this lesson, your students will work on reading comprehensions while continuing to learn more about Peter Pan in their journey through the Peter Pan and Neverland workbook. 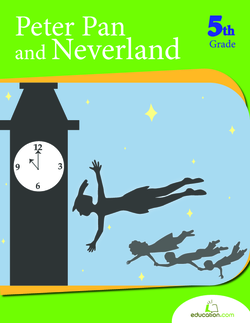 In this lesson, your class continues work in their Peter Pan and Neverland workbooks, focusing on comprehension of Wendy Darling's personality. 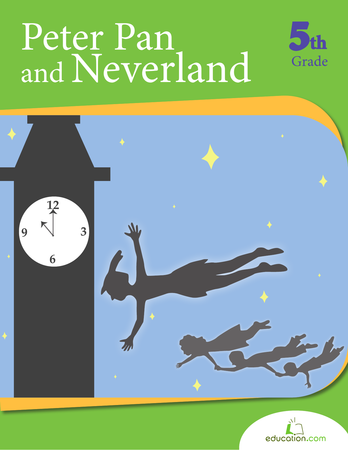 In this lesson, students will complete the final pages of their Peter Pan and Neverland workbooks by taking a more in-depth look at Peter's full character and what possibilities Neverland might hold. We can fly" Your child may never fly, but she'll have a soaring good time with this Peter Pan story and worksheet. With this language arts exercise, students will find textual evidence and use it to support an inference. Then they will have the opportunity to develop these skills further with high cognitive partner and individual activities. Lead your students on the right path with explicit instruction that will stick. Then, back it up with hands on practice on and experience in their own leveled chapter books.